NEW Bradman Gallery: Opened and Ready for Viewing | The International Cricket Hall of Fame. The International Cricket Hall of Fame in Bowral is a Mecca for Cricket Tragics and sports fans alike. Set on the historic Bradman Oval, the very ground where the late Sir Donald Bradman honed his cricketing skills, the new Bradman Gallery, opened in late November 2011, has quickly become the centerpiece of the International Cricket Hall of Fame. The new gallery showcases items from the Bradman Museum that have never been on display before integrating low and high tech interactive technology to tell the story of The Boy from Bowral and his incredible achievements both on and off the field. Other elements of the new Bradman Gallery include a dedicated Bodyline Theatrette, a new interactive Tank Stand display, an interactive Bradman letter trail from 1926 to 2000 and the first ever display of Sir Donalds’ presentation coaching slides, shown in context and replicating his own presentations. Priceless pieces such as Sir Donald’s first cricket bat and a selection of his baggy green caps will be on permanent display. “The Bradman Gallery underpins the International Cricket Hall of Fame and we are thrilled that we can take the Bradman story to a new level and introduce new audiences to the incredible achievements and legacy of Sir Donald Bradman,” said Museum Curator David Wells. 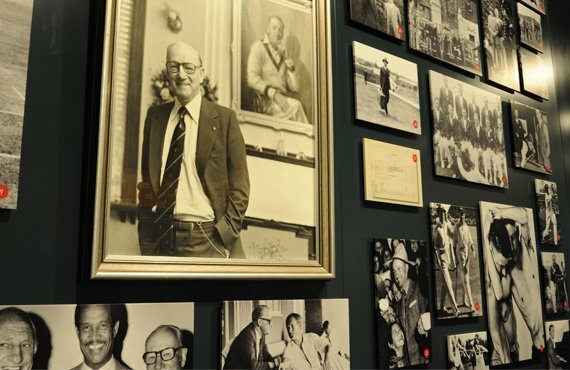 “The International Cricket Hall of Fame goes from strength to strength and opening our relocated and expanded Bradman Gallery gives visitors yet another reason to visit the museum,” commented Rina Hore, Bradman Foundation Executive Director. Sir Donald Bradman is loved and revered the world over, dubbed The Boy from Bowral, Sir Donald Bradman is one of the greatest sportsmen the world has ever seen. He represented Australia for 20 years, playing 52 Tests from 1928/29-1948. Knighted for his services to cricket in 1949, he remains the only Australian cricketer to receive a knighthood for services to the game. He retired from Test cricket with a batting average of 99.94, making his Test batting achievements nearly twice that of the nearest Test batsman.